I’ve been experimenting with making homemade seitan lately. It’s surprisingly easy and definitely cheaper than buying it from Whole Foods. (Luckily it requires wheat gluten, still necessitating a trip to my local Whole Foods. AKA, I still get to be a grocery store nerd and spend my time window shopping through the aisles.) Once I refine the seasonings and simmering broth, I’ll write up a seitan post. In the meantime, I’ve devised this soup, inspired by a batch of homemade seitan that erred slightly on the salty side. Rather than let it go to waste, I decided to give it a good rinse and throw it in a soup. Hence why I leave you to decide your own dosage of salt for this one. The soup was also sparked by some beautiful dinosaur kale that I picked up on one of those habitual Whole Foods outings. I had to justify my liquid Kombucha spendings with something of actually substance, so I went for the kale. 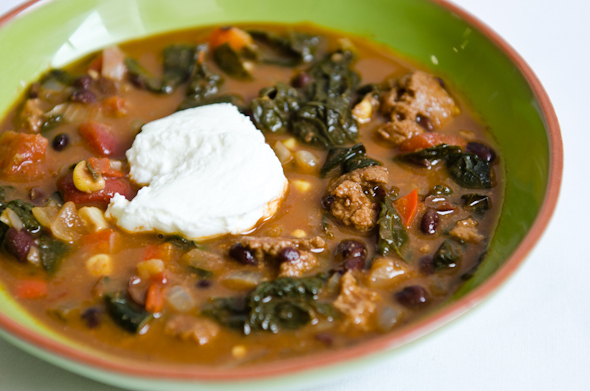 It builds a nutrient-rich, colorful base for this hearty soup/borderline stew. 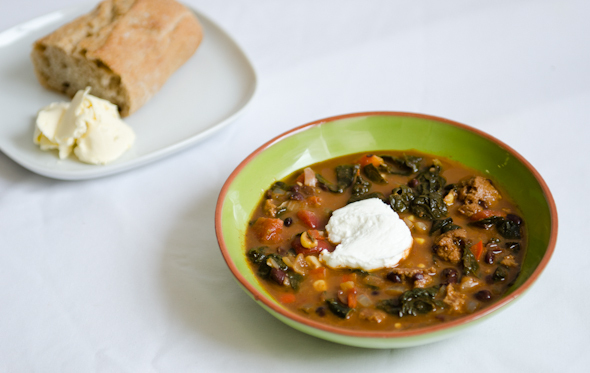 For a warming winter meal, serve with a slice of warm, crusty bread or corn bread. And since I’m on the whole “free PR for Whole Foods” roll today, let me add that the WF vegan cornbread is pretty darn good. In large saucepan, heat oil over medium-high. Saute onion, garlic and pepper until tender. Stir in smoked paprika, cumin, cayenne and pinch of salt and saute for a minute. Pour in beans, tomatoes, tomato paste, seitan and broth. Simmer for 15-20 minutes. Add kale, and cook another 8-10 minutes, or until kale is tender. Serve, topping each bowl with a dollop of yogurt. So this is what people do with wheat gluten? We were getting so many requests for it at the store, we finally got some in (I’m not sure what took us so long, since we have just about everything else!). This soup sounds wonderful. And what a perfect day to post it, as we finally have snow on the ground here! Very impressive! Wouldn’t have thought of making my own seitan. I am eating vegan this month so always looking for new ideas. I could definitely use some guidance on making seitan… I’ve done it before, but it seems like so much work (even if it’s not) that 95% of the time, I’ll just go and buy it instead. However, I just got a pressure/slow cooker for my birthday, so I was thinking that might make the process a bit easier. Any experience using either method? Oh, I guess I’ll just have to wait for that followup post!